Reserve a canopy rent, complete with tables and chairs, from Made For Shade Tent Rentals, LLC, based in Franklinville, New Jersey. 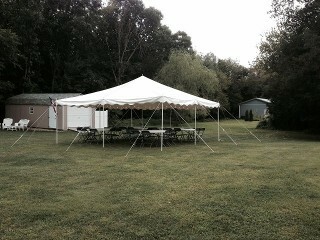 We offer low-cost canopy tent, table, and chair rentals for a variety of events throughout South Jersey. We carry round and long tables for any type of event. The round tables are five feet in diameter, and the long tables are eight feet long. Don't forget to rent chairs. We carry folded chairs and supply eight chairs per table. We deliver, set up, and take down the equipment for you, allowing you to entertain and spend time with your guests. Installation is provided when you rent from us. You may rent our equipment for as long as you need. We will charge you by the day. Contact us to learn more about our range of rental equipment. We service: Franklinville, Gloucester County, Cumberland County, Williamstown, Mullica Hill, New Jersey.